Denard Robinson has been one of the most dynamic players in the country the last three years. In four years at the University of Michigan, he passed for 6,250 yards and 49 touchdowns. He also ran for 4,495 yards and 42 touchdowns. The problem is that Robinson never developed the consistency or mechanics to succeed as an NFL quarterback. As a sophomore his completion percentage was 62.5%. It dipped to 55% in 2011 and 53.5% last year. That type of production won’t get it done in the NFL! 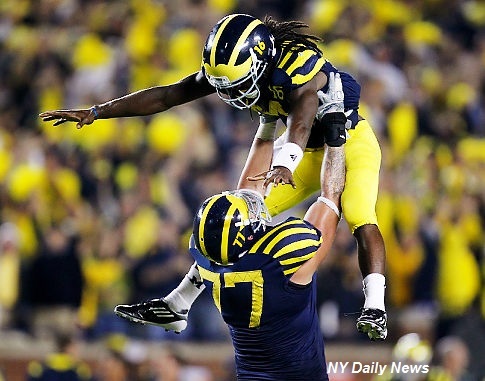 What Denard Robinson does bring to the table is explosiveness with the ball in his hands. He is a special ball player when he gets in space. Once he gets past the line of scrimmage, he’s a threat to go all the way on any play. Robinson is one of those unique players with a very fast first step and is able to get to full speed extremely quickly. He has the ability to juke defenders and make them miss while not losing any speed. Robinson has elite change of direction skills and great balance. It is hard for a defender to get a clean shot on him because of his speed and elusiveness. Despite his size, Robinson is a fearless player that is willing to take on a defender. As a senior, Robinson injured his elbow in the eighth game of the year against Nebraska. He missed two games with the injury. While he was out, receiver Devin Gardner was moved to quarterback and the team won both games that Gardner started. Robinson returned against Iowa and played in the last three games, however, Robinson did not play quarterback. Gardner was playing well as the QB and Robinson still had some numbness in his fingers which affected his grip on the ball. Robinson played the last three games lining up in multiple positions. At times he ran the wildcat and other times he lined up in the backfield or in the slot. The ability to line up all over the field put a lot of pressure on the defense and Robinson thrived, rushing for 320 yards in the last three games. He also caught three passes. To make it in the NFL, Robinson will need to adapt and change positions. He is such an explosive player, NFL teams have to be intrigued, but at the same time, wondering if he can make the position change. Robinson worked out as a wide receiver and punt returner at the Senior Bowl. It was his first real exposure at either position and he struggled. He later told the NFL Network that he still had some numbness in his fingers from the injury which affected his ability to catch the ball. At the NFL Combine, Robinson looked better. He ran a 4.43 40 yard dash and looked much more comfortable catching the ball. If Robinson goes to a team that has an innovative offensive coordinator he could be a special threat. He has the potential to be used similar to the way that Reggie Bush is used. Robinson is very raw and he needs to work on his receiving skills and route running, but if he can put it all together he could make a team very happy that they drafted him. Robinson is a player that loves the game of football and is willing to do whatever it takes. That type of attitude will help him at the next level. Robinson recently had a re-check of the injury and he has regained feeling in his fingers. I believe that Robinson will be drafted in the 3rd or 4th round. Although he’s raw, I believe he’s a guy that you could line up all over and put tremendous pressure on the defense. If a team is patient with him and puts him into packages that allow him to use his break-away speed, I believe he’s a player that can be very successful in the NFL. This entry was posted on April 10, 2013 by draftmaniacs in Draft profiles and tagged 2013 NFL Combine, 2013 NFL Draft, 2013 NFLDraft, 2013 Senior Bowl, denard robinson, Michigan football, NFL, NFL Draft, Senior Bowl.